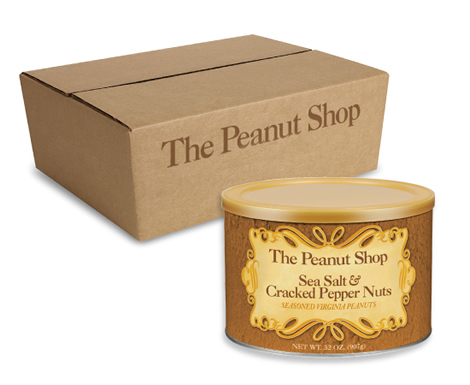 Voted #1 seasoned peanut favorite by our customers in 2014 people's choice awards! 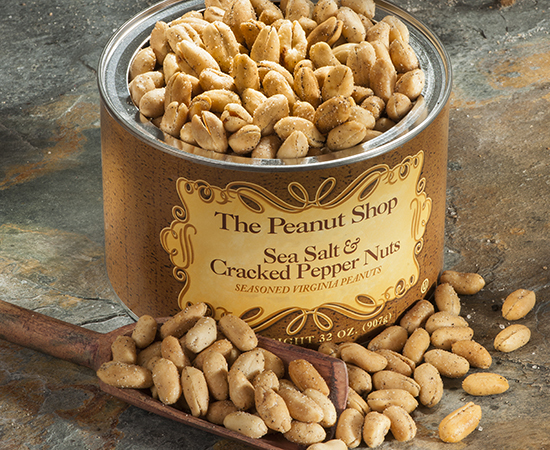 Sea Salt & Cracked Pepper Nuts Handcooked Virginia Peanuts, lightly seasoned with natural Sea Salt and Cracked Black Pepper. It's a no-brainer! Had my parents in West Chester PA send a gift box our way during holidays. We are vegetarian, and nuts make up a big part of our diet, tried them all. These have to be the best ive ever tasted. Amazing crunch, and freshness. Delicious seasonings too! So glad ive been introduced to this brand. All the Peanut Shop's nuts are wonderful, but this one is my favorite. I just can't stop eating them. Absolutely the best peanuts I have ever had. I bought them at TJMaxx on sale and after finishing the can over 2 weeks I went looking to buy more. My son is a chef and he agreed completely. 5 stars, 2 thumbs up, Yummmmy! I don't usually take the time to do reviews, but I had to add my "5" rating. We tried and enjoyed them a year ago at Christmas and lo and behold we found them again this year!!! The best! I bought a 32oz can of the Sea Salt & Cracked Pepper at Marshalls (or Ross, cant remember) about a month ago. Set these peanuts out on my desk and all it took was one day and them boogers were gone. Fortunately, I found another can at Marshalls yesterday and I have them on my desk now but Im a bit selfish with 'em this go round. I love these, the office loves these, we are all happy. They we the best beside the chocolate cover peanut brittle! Found the Sea Salt & Cracked Pepper Peanuts by accident but had to buy them as it sounded so good. When I opened & tried them with family we could not believe how wonderful they were. I will be buying more...for sure! I ran across a large can of the sea-salt and cracked pepper nuts and decided to buy it. I am sooooo glad I did,I have bough two more cans since. They are salty, which is ok by me and the pepper is great too. I had been buying some Belmont nuts with sea salt and pepper, which are good, but in my opinion they don't compare. The Peanut Shop nuts, the salt and pepper actually stick quite well to the nut. They may be a bit pricey, but I think they're worth it. I can't imagine what the cashews would be like, especially if the sea salt is on them. The sea salt being used I feel is very tasty. I would be hard pressed to share these with anyone for sure!! I first tried these last April at the shop in Charleston when some friends and I were down there for the day. They were wonderful, and I have been hooked on them ever since!!! After trying the salt and cracked pepper peanuts I can,t go back to regular peanuts Yum! The salt and pepper nuts are the perfect combination of salt and pepper. Absolutely addictive!